12 Six days before the Passover, Jesus therefore came to Bethany, where Lazarus was, whom Jesus had raised from the dead. 2 So they gave a dinner for him there. Martha served, and Lazarus was one of those reclining with him at table. 3 Mary therefore took a pound[a] of expensive ointment made from pure nard, and anointed the feet of Jesus and wiped his feet with her hair. The house was filled with the fragrance of the perfume. 4 But Judas Iscariot, one of his disciples (he who was about to betray him), said, 5 “Why was this ointment not sold for three hundred denarii[b] and given to the poor?” 6 He said this, not because he cared about the poor, but because he was a thief, and having charge of the moneybag he used to help himself to what was put into it. 7 Jesus said, “Leave her alone, so that she may keep it[c] for the day of my burial. 8 For the poor you always have with you, but you do not always have me. “Passion is a kind of waiting – waiting for what other people are going to do. Jesus went to Jerusalem to announce the good news to the people of that city. 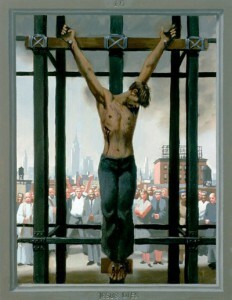 And Jesus knew that he was going to put a choice before them: Will you be my disciple, or will you be my executioner? There is no middle ground here. Jesus went to Jerusalem to put people in a situation where they had to say “Yes” or “No”. That is the great drama of Jesus’ passion: he had to wait for their response. What would they do? Betray him or follow him? And that is the mystery of Jesus’ love. Jesus in his passion is the one who waits for our response. Precisely in that waiting the intensity of his love and God’s is revealed to us”. Recently I sat with a minster friend and we discussed my ministry, it was one of the most insightful, and compassionate discussions in memory. She met with me to share my grief over Vicki’s death, and the discussion became in the way my life is lived in ministry, I live it twenty four hours a day. It is a ministry in which the boundaries of the modern concepts of friendship are put aside, and I see everyone as my friend; friendship’s are not a matter of age, race, social economic standing, religious back ground, none of this matters, it is one in which the views of people, the way they live their lives, be they different from mind, come down to loving them as a person, and does not distract me. Love holds the scale, as it did with Jesus in our story today. This is not a way of living that can be taught or that is easy, it is living it through the years, struggling each moment, to let go of our prejudices, hatreds, biases, and fears, and in so doing loving others without reservation. I was told that I have the gift of being an “emotional sponge”, meaning that I am able to take in the emotional pain of others and hold it, keep it safe, so that they might have relief in the moment. Maybe it is a gift. I believe we are all called to be “emotional sponges”, to hold the pain of others. I find myself keeping to myself much of my own pain because few people can hold it. They tell me find a therapist, and the reality is we all need to be able to share our pain, and in doing so free ourselves of much of that has isolated us in our society. This entry was posted on Sunday, April 14th, 2019 at 6:50 pm. You can follow any responses to this entry through the RSS 2.0 feed.